He killed a woman on her way home from bible study. 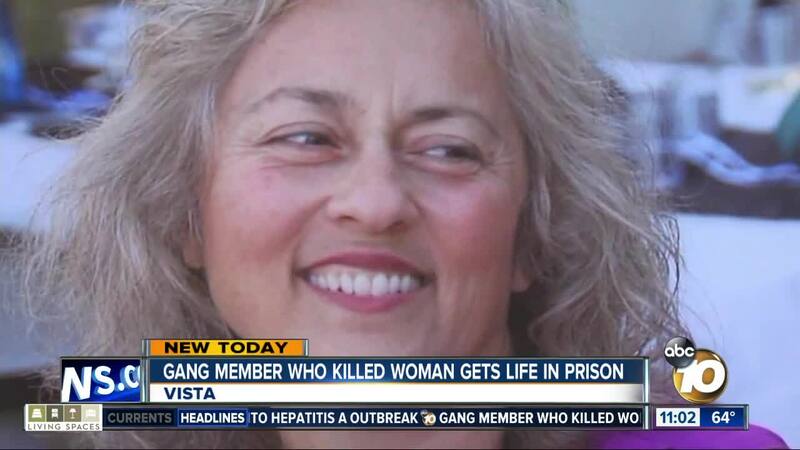 ESCONDIDO, Calif. (KGTV) — The man charged with killing a 55-year-old woman as she left bible study last year has been sentenced. Dionicio Torrez Jr., 25, was sentenced to life in prison without parole for the March 7, 2017, shooting of Catherine Kennedy in Escondido. The judge also gave Torrez Jr. an extra 35 years to life in prison for attempted murder of rival gang members. He must also register as a gang member. Jurors found Torrez Jr. guilty of first-degree murder with a special-circumstance gang allegation, attempted murder, and two counts of shooting at an occupied vehicle in October. Investigators say Torrez Jr. was chasing after two rival gang members who had been tagging near an apartment complex where he lived at about 9 p.m. As the two ran across the street, Torrez Jr. fired several shots. Kennedy was leaving an Escondido church, when she was struck by a stray bullet from the gunfire and crashed her vehicle on Grand Avenue. She was taken to Palomar Hospital, where she died from her injuries. A 16-year-old boy was also arrested in the case and charged in Juvenile Court.